SUMMARY: Fourteen-year old Molly has suffered with anxiety and panic attacks since tragedy struck her family last New Year's Eve. Now, it's the holiday season again, but Molly's family isn't feeling it. Her mom smokes pot and buys stuff all day. Her dad works all. the. time. And Molly must keep her service dog, Pixel, with her at all times so she doesn't suffer public panic attacks. When Molly befriends a homeless girl named Red, she is determined to reunite Red with her family for Christmas. WHAT I LOVED: Molly is Jewish, and her family celebrates (or lifelessly tries to celebrate) Hanukkah in the book. How many Jewish protagonists in YA literature can you think of? And how many of those Jewish protagonists are in Holocaust or WWII stories? Once again, authors and publishers, we need more diverse protagonists! It's getting better slowly, but white characters still dominate today's YA literature. We can do better, y'all. I love that mental illness takes various forms in Saving Red. We have Molly, who suffers anxiety and panic attacks. Molly's mother is clearly depressed after her son went missing last year. Molly's father, who we do not see as much of in the story, is also covering his pain by working all the time. I'm no psychologist, but he's probably dealing with depression, too. Molly's brother Noah dealt with PTSD after returning from Afghanistan last year. And then there's Red. Red tells Molly that she is schizophrenic and manic. She talks to and takes advice from two people who are not there. Her impulsive behavior sometimes puts herself and others in dangerous situations. I am so proud of the way YA literature in the past couple of years have really taken on mental illness. Our young people do suffer from all kinds of mental illness, either their own mental illness or that of family members or friends. Chances are very good that most of the students in our middle and high schools know someone or are themselves suffering from depression, anxiety, PTSD, eating disorders, self-harm, addiction, bipolar disorder, OCD, or other disorders. It's high time we shine a light on that and bring it out of the shadows. When we talk about mental illness openly, it removes some of the stigma surrounding. 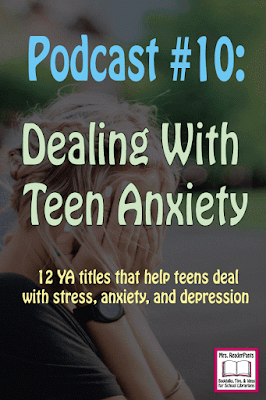 It gives young people and their families the language they need to take steps toward getting it under control. I loved the ending, particularly the last two sentences. When the book drags a bit in the middle (it does), hang in there. The last two lines are worth it. 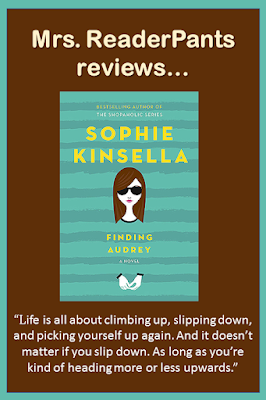 WHAT I DIDN'T LIKE: The story is somewhat interesting, but it drags at times. What most kept me going was that I thought there was going to be an unreliable narrator twist happening at some point. **Spoiler alert here--highlight to see--> I thought for sure that either Molly or Red (and possibly Cristo and the dog Pixel) were made up entirely. There were signs of this, like when Molly starts to hear Red's two "invisible friends," Lana and The Duke. And when Molly goes to save Red from jumping off the cliff and ends up contemplating jumping off the cliff herself. And in the secrecy about Red's name (surely that's not her real name) and address. I thought when Red gave Molly her phone number, that it would in fact end up being Molly's phone number and Molly's own mother answering on the other end. Now that would have been a cool twist! Alas, it wasn't to be, and I was disappointed by that. Cristo seemed far too perfect, which also made me think he might be a figment of Molly's imagination. After just meeting and talking for a few hours, Cristo goes on a family vacation to New York. He and Molly text and send selfies and sweet messages of how much they like each other while Cristo is gone. It just doesn't seem realistic for a young character who suffers from severe anxiety to just attach herself to a stranger so quickly. And if she did attach herself that quickly, it doesn't seem like something that would be healthy for her. Cristo also gives Red (a complete stranger) permission to sleep in his family's backyard and have a key to their house while they are on vacation. Something tells me his parents don't know about that decision, and this also made me wonder if ridiculously-kind Cristo was not a real character. Sadly, he was real. Even Molly's dog, Pixel, didn't seem real. Are service dogs allowed to go on ferris wheels? I have no clue. And while he didn't actually talk, Molly seemed to believe she knew what he would say if he could talk. And what dog plays and snuggles with a stranger's cat? I've had cats and dogs as pets my whole life, and I've never seen any of them snuggle together. THE BOTTOM LINE: While this story is set during the holiday season (both Christmas and Hanukkah are mentioned often), it's not really what I'd call a "Christmas book." 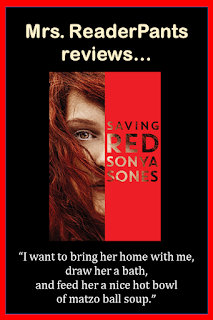 The holidays in Saving Red give Molly a definite deadline to reunite Red with her family. They help underscore the despair that Molly's family faces since the disappearance of her brother Noah one year before. If you are looking for a "feel good" holiday story, this isn't it. 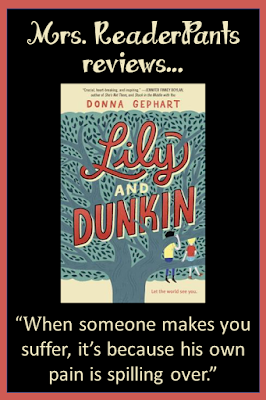 But it is a worthy addition to school and public libraries for its realistic portrayal of mental illness and its affect on the family members of those who suffer from it. STATUS IN MY LIBRARY: We just received this in the library, but it has not been checked out yet (despite being the holiday season and the fact that I've talked about it with several classes). I'm honestly surprised it hasn't been checked out yet; usually the titles I booktalk fly off the shelves.